Tags: Copyright and music licensing, MP3 tutorials. a.) Credit the original work creator in case the work will be shared or distributed by public users. b.) Protect the copyright owners against unauthorized use. It is because if an object is watermarked (for example images), then another user cannot easily claim they owned that because of the presence of watermark crediting and acknowledging the original creator. c.) Promote the name of the brand or company creating the work. You have seen this in copyrightable photographs where the watermark bears the presence of the photo studio responsible for the work. Similar with photographs and copyrightable images, watermark can also be used with music copyright application and sound recording such as MP3. Back in the old days, sound recording copyright owners depends on the ID3 tagging system to credit and place the name of the artist, creator, album, etc. Although the ID3 tagging system proved to be a success in identifying the work; it does not provide sufficient protection against unauthorized use. It is because if an MP3 is re-encoded or re-processed using an audio editing software or mp3 tagging software, the original ID3 information would be lost; thus the MP3 would be re-distributed without proper credits and information to the original creator. Watermarking is designed to survived even if the audio is re-encoded, re-processed or undergo any means of MP3 tag editing and audio processing. In other words, once the watermarking has been embedded with your MP3 audio; it is now permanent and irreversible. And there is no other existing technology that could have 100% accuracy in separating the watermark from protected MP3 audio. 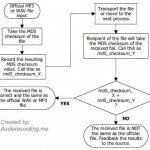 What is the best concept of watermarking MP3? I have initially read an article from Michael Borges in License Quote here. 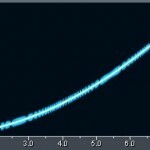 It shows the difference between non-watermarked MP3 vs. a watermarked MP3 audio. The key is knowing how to make a voice over to your existing MP3 that you want to be protected. This will be clearly illustrated below. This voice over can be your own voice or any method such as an automated/programmable voiceover software. To be “permanently embedded”, it will be mixed with your MP3 and the result is the watermarked audio. You can then embed your ID3 tags such as ISRC (see an example here on how to embed and read ISRC codes on MP3 files). You can then use this MP3 as a preview file in your website (where you are selling or offering your original work for licensing). This preview file is only used for public demonstration of your work. So if it gets shared to another sources (such as in a file sharing system), your originally created work still have its watermark that can be identified by any listeners and potential fans. However the actual MP3 file that your customer would be receiving (after purchase) should not contain any watermark. a.) When used as a preview files, listeners can identify the song creator or other information embedded in the watermarked. This will be a big factor in the song marketing. b.) You do not have to worry about your MP3 being shared to other users, the watermarked on them can help the user trace the original source or creator.